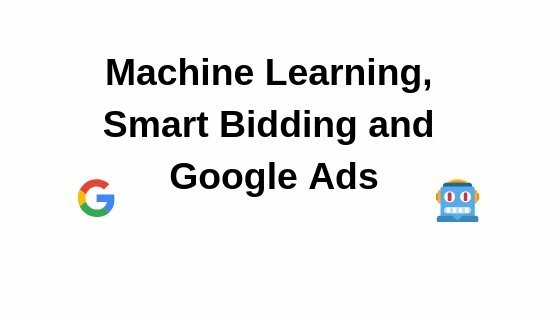 Google Ads has one of the most sophisticated machine learning-powered bidding offered as a self service product. This means every advertiser, no matter how small has the opportunity to use this really advanced technology to run ads. Smart bidding is automated bidding in the advertising auction, which is based on different factors like the history of the advertiser and the user, how relevant the ad is, the time and day when the auction is happening and many other factors. Smart bidding takes into consideration all the factors to eventually deliver the most relevant ad to the user at the right moment for them. How does Smart Bidding work? Smart bidding determines the right moment and the right user based on the history of conversions. The more conversions you have in your account the faster the algorithm can learn. Conversion can be lead forms submitted, online purchases, even just certain time spent on a page. These are all valuable actions users have taken on your website. You can also assign monetary value on the conversions based on your history. How to calculate conversion value, learn from this video, I recorded. Except for conversions and bidding, there are also other criteria which can improve your performance and help you make the most out of smart bidding. RSA is a type of text ad which has multiple headlines and descriptions which are mixed and matched depending on the search queries and click through performance to find the optimum combination. In the beginning it might look like a lot of effort – coming up with 10 different headlines and 5 different descriptions for each of your ad groups. There is an easier way – you can simply use the recommendations tab. Automated recommendations would generate responsive ad ideas from your most active ad groups. You can simply download the recommendations in a spreadsheet and add finishing touches to the auto-generated list. Then you can upload all the ads with Google Ads Editor – they would be routed to the correct campaign and ad group. Compare the results in a few weeks. Most likely you will see the responsive ads outperforming the extended text ads significantly. Keep an eye on which headlines were most shown – this would give you an idea of the most appealing content for the user, so you can continue adding new ads with the learnings. I have been blogging and vlogging about attribution a lot, since it is one of the most underestimated parts of PPC advertising. Attribution is simply a philosophy – a discussion about the significance of each touch point from the user journey. There are many models – Linear, Time Decay, First-Click, Last-Click, Position-Based – you can watch this video explanation of the different attribution models. Why is it so important to switch away from the last-click one? If you are using Smart Bidding, this means that your campaign will auto-optimise for the conversion you have set up. If you give all the conversion credit to the last click – this is what they smart bidding will try to get you – last clicks, However, this is an increasingly skewed vision on the way users interact with ads. Salesforce’s research shows that there are 6-8 interactions before a lead is generated. If you only count the last one, you are missing out on opportunities. Users who have been already on your website are more valuable than the ones that come as a cold traffic. Returning visitors have to be treated with priority and this is what the smart bidding would do, if you provide the data. Thankfully bidding on all the remarketing lists which you have set up will appear as suggested changes in the Recommendations tab. If you are running a smart bidding campaign, you do not need to set up a bid on your remarketing list. The algorithm will recognise if a user making a search is also on the remarketing list and bid higher for them. Using remarketing lists or similar to remarketing lists can help your smart bidding campaign perform much better. The more organised ad groups, the better. You must have your account structured by themes. The best practice is to keep one keyword per ad group and include multiple variations of the ad containing this keyword. The more granular you get, the closer would your ad match the search querie. Make sure your landing pages are as close as possible to the keyword. Never send all users to the same page. People are very impatient when browsing online, so they are likely to go away if they don’t find what they are looking for immediately. Try the Smart Shopping Campaigns of Google. They are fully automated, taking over the targeting and bidding. All you need is products feed uploaded in the Google Merchant Center and a budget for the campaign. Group products with similar Return on Ad Spend (ROAS) together. Otherwise you are likely to have some products with a very different ROAS struggle with exposure – simply because the algorithm cannot find enough opportunities to give the ROAS which your other products have. For example – cheap swimming suits with tiny return have to be split in an ad group, optimised for los ROAS. The expensive snorkeling gear with high return must be in a different ad group, optimised towards the high ROAS. Take advantage of the Responsive Display Ads. Similar to the responsive search ads, responsive display combines images, logos and text to make the optimum ad which fits in every inventory. Instead of creating thousands of banners from each size with each different message you want to test, Google will auto-match the assets you provide and give you the best-performing combination. This is powerful learnings for future campaigns and marketing messaging in general. You can also try Smart Display Campaigns to take advantage of the full power of automation, Similar to Smart Shopping, these campaigns auto target and auto bid – you only have to provide images, logos, ad text and the total campaign budget. Eventually allow time for the algorithm to learn, once the campaign is set up. It takes 2-4 weeks for a smart bidding campaign to start performing at its fullest potential. In the meantime keep an eye – very low volume would show you that the target cost per acquisition or return on ad spend is too ambitious. With Google you will always have the tradeoff – more volume at a higher cost per result, or less volume, but more return. This entry was posted in Google Adwords, Remarketing and tagged artificial intelligence, google display network, google shopping, paid search engine, smart bidding.